The Sun News Network today is heavily pushing a story alleging that Liberal leader Michael Ignatieff was involved in planning the 2003 invasion of Iraq led by U.S. forces. As is well known, Ignatieff was initially supportive of military action in Iraq, though he later publicly changed his position. The Sun dug up a quote from U.S. Col. Gary Crowder at a press conference describing efforts to limit civilian casualties in the opening stages of the Iraq war. I called up Sarah Sewall at the Carr Center today. She told me a rather different story. She said Ignatieff, as director of the Carr Center, came to conferences such as “Understanding Collateral Damage” held in Washington, D.C. in June 2002. “I designed the conferences and ran the conferences and Michael came because he was director of the Carr Center,” Sewall said. As the participants list for “Understanding Collateral Damage” conference shows, Col. Crowder and other U.S. military officers participated, but so did Amnesty International, Human Rights Watch, Physicians for Human Rights, Refugees International and even a writer from the Boston Globe. Ignatieff was also attended the Carr Center conference “Humanitarian Issues in Military Targeting,” in March 2002, along with Amnesty, Physicians for Human Rights, Medecins sans frontier, and many other groups. In October, he attended “Ground Operations Workshop,” also with humanitarian NGOs participating. Sewall further explains that the Carr Center had been doing sessions on collateral damage with NGOs, academics and the military for about ten years. I asked her if these could in any way be construed as helping to plan the invasion of Iraq. If the Sun was unaware of these groups also participated in “invasion planning,” that’s just shoddy reporting. It took me four minutes to find the participants list on the Carr Center website. If the Sun knew and chose not to include this fact in the story, readers can draw their own conclusions about the integrity of the reporter and his news organization. So is it “Sewall” or “Sewell?” Your story uses both, adding “(sic)” after the Sun’s use of Sewell, then using Sewall yourself before reverting back to the Sun’s spelling of her name. Yeah, thanks for pointing out. Corrected. It’s Sewall with an “a” not an “e”. I need an editor. And how did that humble pie taste? BITTER? Good stuff, Glen. Thanks. Like Iggy, I, as a casual adviser and friend of Defence Minister McCallum, was wrong about the war. I supported it initially, unaware it was based on a damnable lie. McCallum and Bill Graham, as Ministers, admitted the need for it and actually indicated Canada might join. Chretien wisely over-ruled them, the smartest decision he made.. I now what The Sun is trying to do, but all Lilley’s column demonstrates is that Ignatieff is against killing civilians, and is willing to re-examine public policy. These are good things. Of course, all they want to do is have some outlandish cover image slandering their political opponents. I hope it doesn’t work… but I’m sure some people will be convinced. Who cares what the Sun says. it’s a right wing rag and everything they say will be biased. No credibility. If only it were that easy. Unfortunately, and as others commenting here have noted, the facts are a second-tier priority for outlets like Sun Media (if a priority at all). It’s not about convincing people’s rational minds with any substantive or well-researched information, but making base emotional appeals. It’s about creating petty narratives that work in the same way as celebrity gossip magazines or reality television. People get sucked into the vortex because there is some shock value, and because our basal, irrational sides get excited hearing ‘exclusive’ information – we like to feel as though we’re a part of the club. In short, it might not be you or I that will be sold on Sun, but its effects can’t be overlooked. I would agree that even having now been rescinded, this story will have already caused damage because it has served as another line in a fabricated narrative, satiating the thirsts of those who already know what they want to hear. Perhaps, by way of contrast, Ezra Levant of the Sun’s very own chattering classes will remind us what his own position was at the time. Unless, that is, he agreed with Iggy. That could be embarrassing for both of them. The Sun not checking facts? Don’t they have minions that could perform these tasks BEFORE publishing twaddle? Sun Media reporters like Mr. Lilley et al are 4 stops below their contemporaries at the National Enquirer and alike. Reporting facts with the proper context intentionally omitted makes for nothing more than fiction. I’d expect this from the CPC War-Room. Media outlets like QMI/SunMedia should strive to achieve a degree of professionalism, else the reader will should assume QMI/SunMedia and the CPC War-Room are just one single entity! 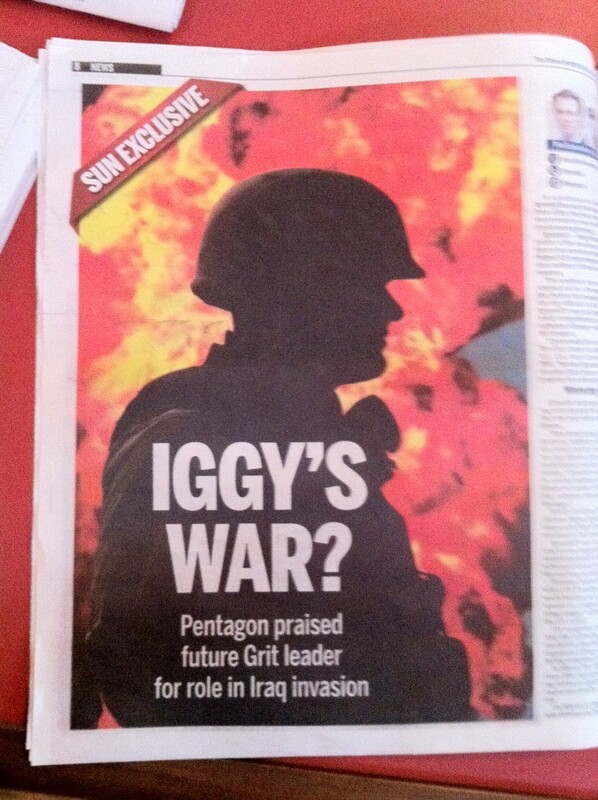 Iggy’s an American Liberal Warmonger! Take that you knotty Progressives! I just added a link to this post on the Sun’s article. Please don`t make me laugh, my lips are chapped. I read the Sun article. It is very soft in background checking. If I had to take a guess it’s because that astute reporter Mr. Lilley was too busy picking his backside instead of doing any in-depth fact checking or even balanced reporting. But then maybe he only gets paid a half salary for doing a half-hand-job when he writes his articles! But it was recognized in the USA that then Professor Ignatieff of Harvard was the preeminent neocon supporter of the Bush-Cheney-Rumsfeld regime and their preemptive attack on Iraq, all based on his “Lesser Evils” thesis in defence of American democracy and hegemony. Once he arrived in Canada as a born-again Canadian, he quickly eschewed his sordid past political record in the USA and Britain, but has not completely recanted on his considered academic opinion in “Lesser Evils”. His 2006 “mea culpa” admission in the NY Times, while running for the Liberal leadership, was termed more “mea” than “culpa”, as he tried to blame Bush for misleading him on Saddam’s WMD. Of course, Ignatieff will say and do anything to become the PM of bucolic Canada … and become a crazed academic with absolute power. And your point would be that if GW Bush provided false information that lead to a certain conclusion by others then it is the conclusion and the people making that conclusion that are at fault and NOT Bush? Well, you are a smart one….or Republican….or Conservative….or at least two out of the three! Do you really believe that the people that watch taht tripe are going to take part in the effort needed to find the TRUTH? Fat chance. Isn’t this slander? A conference in June 2002 and an invasion March 2003..
Are we supposed to seriously believe that U.S. Col. Gary Crowder, on March 19th 2003 publicly singled out Ignatieff because he remembered a conference almost a year prior to the invasion? C’mon now, McGregor. You are spinning this issue so hard for the liberals you are at risk of falling off your chair. Iggy clearly cheer-leaded from the left in the run up to the Iraq invasion, this is not disputed by anyone and there is documented public works out there that go into detail quite significantly about Iggy supporting the invasion, but if you feel you must try and cover for his actions, go ahead. Today while speaking on this issue to the media, Iggy saidthrough his support pre-war, he was trying to prevent humanitarian losses – i guess 1 million dead civilians is “acceptable” in his view? I am not the one who has to account for my actions, Iggy is the one who gave cover from the left for the Iraq invasion and quite frankly it is disgusting you are now trying to give Iggy cover onthe very issue, McGregor. Shame on you and shame on Mr. Ignatieff for suggesting 1 million dead civilians is somehow “great” work as he implied today during his interview. You have left me thoroughly grossed out with your ignorant reporting on this issue. Of course, I did not agree with that, but then again these people constantly besmirch my good name. So, the Sun bringing this up now is pot…kettle. Also indicates a short memory, which may be a result of political alzheimer. Ignatieff changed his mind. Harper, sadly, did not. Note that I refer you to a right wing forum so you can’t refute what it says although I’m sure you’re going to try. Btw, ignore the comments…I did. I know that conservadroids like yourself have a hard time discerning the difference between facts and party doctrine, but perhaps your real anger is that McGregor put a stake through the heart of this story? I think I need a shower. Lilley is no journalist. The Sun? My gosh, does anyone know who owns the Sun? The neo-separatist Péladeau family. Wonder if our little reform-alliance-conservative clueless faithful know that. That same Sun group that has just saddled the air waves with a Canadian Fox clone that hugs the extreme right, fans of Palin and fundamentalist Yanks, not to mention the John Birchers and NRA. That they would publish this trashy story, never telling a lie, but omitting the basic facts on Ignatief, is typical of the Republican = Conservative trash that wannabe Americans in Alberta and other Reform feed on. Bravo, Sun.